This week we have a guest post from Lauren Burton. Lauren is the leader of the Find Your Mark chapter in Nashville, TN, and she and her husband lead an annual team to our Care Center to provide dental assessments for each child. Her journey with Touch A Life began as an observer at a fundraising event, and now three years later, she is an adoptive parent and a key supporter in our work happening in Ghana. This month she will travel to Ghana with her family and adopted son, Micah, and will be sharing her family’s experiences throughout the summer. Sometimes life can feel monotonous. Like it is nothing more than a never-ending cycle of to-do lists and errands that threaten to define us. Sometimes though, maybe even every single day, God sends us opportunities that are meant to free us from this trivial haze. One of my chances came in a phone call from a friend inviting me to come with her and a medical team from Nashville, Tennessee, to work with the Touch A Life Foundation in Ghana. As a mom to three young children, it was the last thing I had time for, but it was suddenly the only thing I could think about. It defied logic. I’m not medically trained or even inclined beyond simple bandaids and Advil. What would I do in Ghana and could that expense be justified? Was there a place for me? I had heard Pam Cope speak at a local fundraiser a few months before and her work had moved me to the point I had excused myself from the table where I was sitting to quietly sob in a bathroom stall. My firstborn child, a son, was the exact age of the boys she was describing. Their disparity of circumstance was too painful to digest. I had heard stories and statistics of the suffering in the world countless times before, but for some reason this one broke through my indifference and left me gutted. Now, months later, I was being offered an unsolicited chance to see the flesh and blood and ministry up close. I couldn’t explain it, but I could hear God whispering to me that yes, there was a place for me. It was on that first trip in April of 2011 that our team came upon a little boy at a mobile medical clinic who some Ghanaian abolitionists identified as “trafficked.” I was doing my best to avoid anything that oozed in the medical line, but instead soon found myself sitting face to face with the devastating reality of why we were there in the first place. This five-year-old was broken and suffering. He was hungry and sad, and despite my considerable efforts, I could not earn his smile. I didn’t know how to help with the aches and pains in the clinic, but I knew how to love a child. Because of the foundation the abolitionists had laid and the resources they had put in place, we were able to negotiate the boy’s release that day. We put him in our boat and moved him into Touch A Life’s facility that evening. I didn’t know it yet but my encounter with that little boy would change my family’s life forever. Exactly two years after our first meeting, in April of 2013, Micah Dziadzom Burton landed in Tennessee and joined our family through the miracle of adoption. Micah has been home for 14 months now. It has been triumphant at times and tragic at others. He has wholeheartedly embraced many things about our culture, but none more than our food. If you can serve it, he will eat it. He’s gained 23 pounds since his arrival and grown several inches. He plays soccer, basketball, and piano. He makes friends easily and has a smile that can light up any room. He is somehow thriving in a family who can not dance and speaks primarily in sarcasm that confounds his love for the literal. But he has also grieved. He has grieved deeply for his family in Ghana. This surprised us a bit. I met him in despair and rejection, but you see that was not the end of his story there. In the two years it took to bring him home, he was loved. He was loved very well we found out. Touch A Life gave him his first real home. He had brothers. They weren’t biological, but if adoption has taught me anything it is the insignificance of this detail. They were bonded through shared pain, but more importantly through a shared deliverance. These boys are never far from his mind. Every fun new experience is tinged with a bit of sorrow as he longs to share it with them. After Halloween he immediately divided every single piece of candy he had collected into 50 individual bags to send with the next team for every friend he left. There have been many nights we have offered trite consolations as he has cried himself to sleep from the pain of losing them. We have heard from friends who have adopted from abroad that their children prefer to distance themselves from their former culture and identify solely as Americans. On the contrary, Micah is mildly offended when we refer to him as American. He is Ghanaian and proud of it. 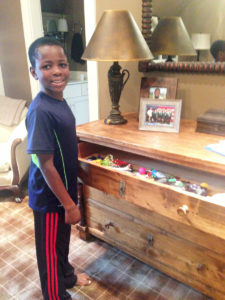 His room is decorated with African art, wood carvings, and drums. He speaks on all subjects, even those he has little knowledge of, with the natural authority of a Ghanaian chief. Touch A Life not only rehabilitated his body, they reclaimed his heritage for him. There were many times during the long, complicated adoption process that I became so discouraged by the pace things were proceeding at. Whenever I voiced this frustration to Pam, she would calmly assure me that God knew what He was doing. She was convinced there was something Micah needed before he could come home with us. I can see now how right she was. As painful as it is to watch him suffer, we have a deep peace that God was writing Micah’s story long before our page was turned. Touch A Life is a beautiful chapter in it. God has brought an amazing thing together on some dry soil in a Ghanaian city that surely translates “middle-of-nowhere,” Ghana. He has re-written people’s pain from every corner of the planet and as only He can, turned their sorrow into dancing (and drumming!). 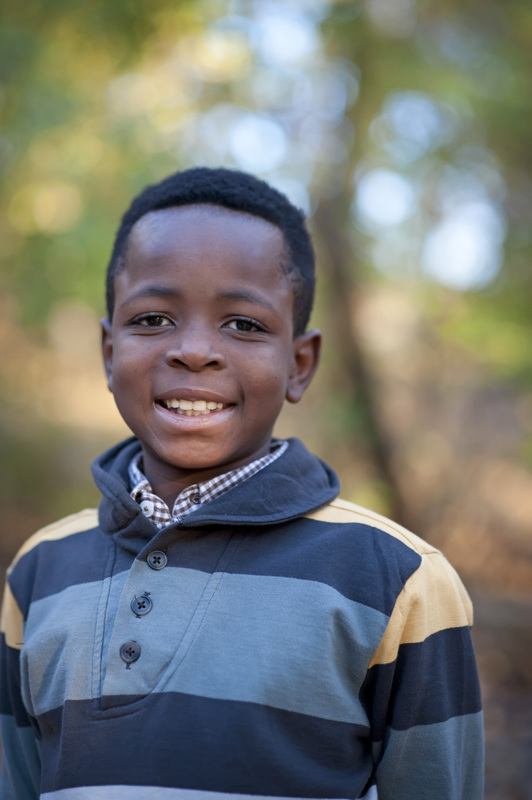 Micah has prayed every night for months and months for the chance to go back to visit his brothers. This month he is finally going to get his wish. My husband and I are leading a team that will build sidewalks on the Touch A Life Care Center property and take care of the dental needs of all the great kids in residence there and Micah is going with us! Micah has been mentally packing his bag for months with all the trinkets he has been anxious to share. There are pieces of candy, Happy Meal toys, party favors, used sparklers from his first Fourth of July, and many other interesting choices that will be making the trip with us. He has developed quite a skill for guilting his siblings out of their belongings to contribute to his “Ghana drawer,” where he has been storing his treasures. As a mother I am nervous for him. I have no doubt his old friends will think he talks funny. He does. As the African accent has melted into our southern one, the result sounds oddly Mexican. I can’t explain it, but I’ve laughed at it. His life and context are literally an ocean apart from their’s now. He has been in eight states and stood on the shores of the Pacific, Atlantic, and the Gulf of Mexico. He can play the works of famous composers on the piano, and he can read music. He is passionate about Pokemon and Pei Wei. He understands the American game of basketball on an instinctual level. We have systematically stripped the independence his life before required from his daily routine. He now depends on us the way an eight-year-old child should. He glances my way for approval before doing most anything. They won’t get the jokes he has been memorizing to tell them, and his stories will be full of references they don’t understand. Hopefully they will see his love for them and not only his metamorphosis. Hopefully they will see his desperate desire to return to them and stay connected to a part of his past he did not choose to leave. Hopefully they will remind him of the love God has blessed him with, and not just the pain of the loss. I cannot seem to help myself in my overly analytical moments from wondering if there will be a place for him there? But wait…thank you God, I remember the last time I asked this question about myself. And the answer. Thanks, Lauren, for sharing how Micah is doing. Morris and Cheryl have shared some, but we are so glad to read your comments, knowing this has been a huge adjustment for him and for you. It is wonderful to see how well you understand him, and that you are taking him back to his roots. Things will be different, but I know you are prepared to help him see and understand the changes he will experience. We hope your trip will go well, but God will be leading all of you through it. Ohhhhh, how I loved reading this! Thank you for blessing us by writing this, Lauren. It’s such a wonderful story of God’s goodness, faithfulness, provision, and love. I am so proud of you and Jamie for trusting in His Plan for your family. It’s truly inspiring and encouraging. I will pray for all of you as you take Micah back to his roots and that God will bless your time there. Your family is loved by many! What a touching story this is. Clearly, God has a plan that he is working through you and your family. I am looking forward to the posts to follow. ← Garage Sale Registration Closes June 2!